It is no longer news that Nollywood actress Omotola Jalade married a Benin pilot, Captain Matthew Ekeinde in her teenage years. But her long kept secret has been finally exposed. Unknown to Omotola herself, she has a 17-year-old spiritual son in Igbo land. On Friday, he finally showed up as she was about leaving the set of Alter Ego movie in Lagos. Enough of joke, let’s get to the real gist. 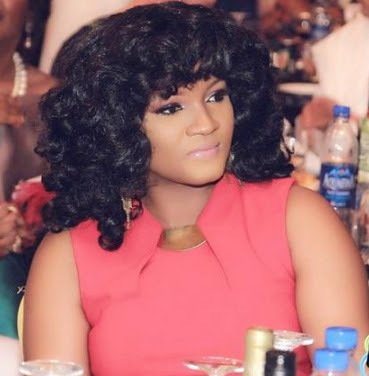 The young man in the video you are about watch told Omotola a man he was living with in Niger State told him his mother is an actress in Yorubaland. The confused guy who identified himself as Chinonso said a spiritualist told him he is Omotola Jalade’s spiritual son. 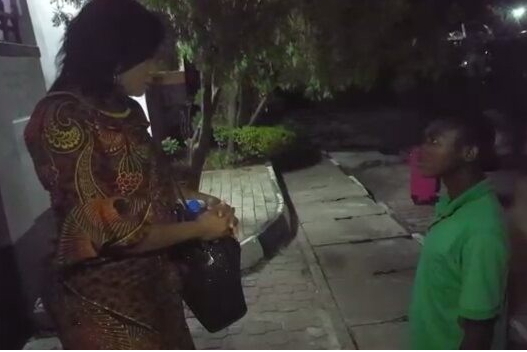 Watch Omotola drill the heck out of the young man in the video below. Suffering can make people imagine funny things at times. 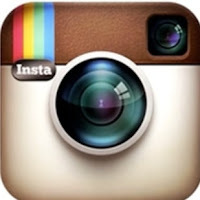 Very hilarious video… Hope Omotola Jalade ‘dashed’ him something. This young man definitely needs help. OMOTOLA NA NOW I KNOW SAY YOU TOO NOR WELL LIKE THE BOY!!! YOU SHOULD HAVE LAUGHED OVER THIS ISSUE AND GO AWAY!! THE BOY IS HAPPY THAT HE IS FOOLING YOU. Help him!!! I am very sure in another few days, so many young boys will adopt this means of begging. It takes someone to start and many people will join. What’s the name of the movie cos this can’t be for real…. I mean the interaction between the two. I am not blame the boy bicos is not today wey I have start to wish say Omotola is mother. It have tey long ago. I am suffer. But Omotola is get money and come to dey fine on top. Is make me to wish say she be my mother. Also wish say she love me and buy me car and good things and carry me go America. Naijagist, abeg make you telling Omotola say somebody is dey for here weyris fall in love on top of her and weyris also dies for her. I am dies for her. Recession will cause a lot of problem for nija. wetin poverty go cause hen..
the only thing I can say tu dis is dat..maybe she might av a kid outside there..I think dat shud be the reason for her to react like dat..